= Anodontites tehuantepecensis Crosse & Fischer, 1893. — Bogan (2010). = Anodontites tehuantepecensis (Crosse & Fischer, 1894). — Graf & Cummings (2007). = Anodontites tehuantepecensis (Crosse & Fischer, 1894). — Frierson (1927). = Anodontites (s.s.) tehuantepecensis (Crosse & Fischer, 1894). — Simpson (1914). = Anodonta (Pachyanodon) tehuantepecensis Crosse & Fischer, 1894. — Martens (1900).
? cf. Glabaris tehuantepecensis (Crosse & Fischer, 1894). — Simpson (1900). = Anodonta (Mesanodon) tehuantepecensis Crosse & Fischer, 1893. — Fischer & Crosse (1894). Anodonta tehuantepecensis Crosse & Fischer, 1893. Crosse & Fischer, 1893, J. de Conch. : 32. Fischer & Crosse, 1894, Miss. Sci. Mexique, Rech. Zool. : 526, pl. 70, figs. 1-1a. 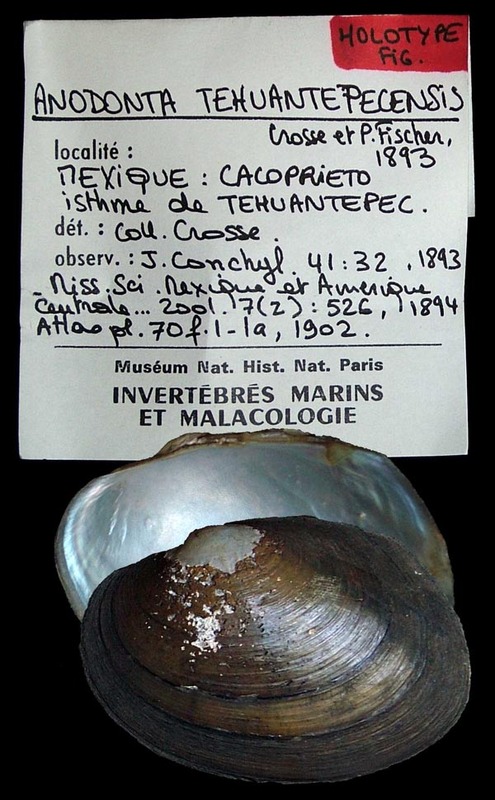 Type(s): HOLOTYPE (MONOTYPY) MNHN-IM-2000-1798, Mexique, Cacoprieto, Isthmo de Tehuantepec.